There are several really good ebooks on sale this week! My Lady Jane is one of my favorite books that I ever got in one of my Owlcrates and they just revealed the cover for My Plain Jane that comes out next year (WHYYYYYY????!!) and I’m super excited about it! The Crown’s Game was a good read, I also got to meet the author Evelyn Sky when she came through on the Epic Reads tour and it was fascinating to hear her background and why she focused on Russian History. Very interesting story. 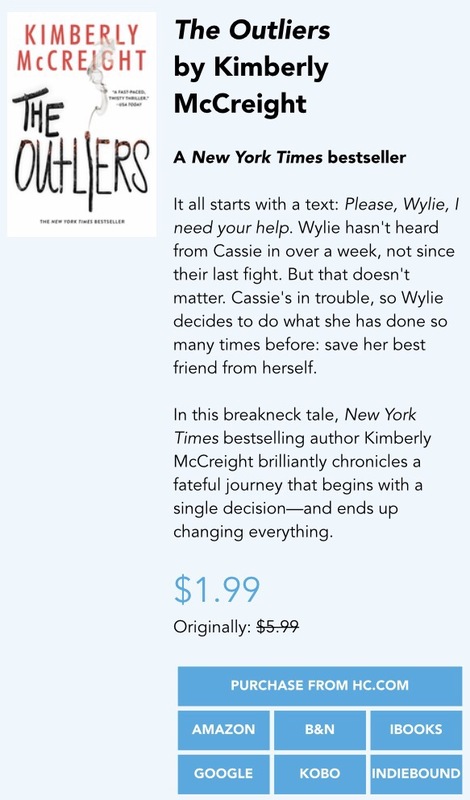 I also got to meet Kimberley McCreight the author of the Outliers at the same tour! The other three are on my TBR, I have seen both the movie and the Broadway show of The Color Purple but I have yet to read the book. I’m considering setting a goal in 2018 to read a classic one a month or something like that..
I’m not sure when these deals expire so get them for dirt cheap prices before they are gone! BTW I DON”T get paid to promote these. I just get a lot of deals sent to my inbox and I want to share them with book lovers! On sale on Kindle, Nook and iBooks! I hope yall can snag these darlings up, they truly are some of my favorites! There are 4 great ebook deals going on right now! One of my all time favorites is The Scorpio Races! I love Maggie Stiefvaters writing and I recommend this book to people all the time. The Rest of Us Just live Here was a book I recently read and really enjoyed. The other two are on my TBR. I was super excited to see The Forgetting is on sale and snagged it! There are some pretty awesome e-book deals going on this week. All of these are on my TBR and Vassa in the Night was Owlcrate’s book for last October (I still haven’t read it I know shame on meee!) The Thousandth Floor has a sequel releasing soon and Into the Dim just had a sequel released earlier this month so now is the perfect time to get em cheap and read em fast! For Sale on iBooks and Kindle Store for sure. One high school girl’s comedic examination of her dating past as told by the friends, family, and boys who were involved! Six of Crows is also still on sale until 9/4/17 and trust me when I tell you this is an AMAZING read! Leigh Bardugo is a talented author and an auto buy for me. READ THIS BOOK! Most of these deals last only until the end of the month. There are several awesome e-book deals going on today! Six of Crows aka the magical amazingness penned by Leigh Bardugo is on sale for $2.99! Such an amazing read, I highly recommend it! These next 5 are all on my TBR. I loved Armentrout’s Luxe series, I hope this one is as good. These next 3 are all on sale through iBooks. Not sure if they are available for this price on other devices. If they are, please let us all know in the comments! There are several good e-book deals today and one is a freebie! All of these are on my TBR and I’m really looking forward to reading them!